I can be contacted most times of the day/evening, seven days a week. 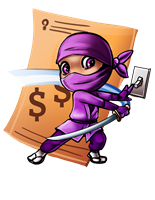 Energy Ninja will help reduce your energy bill costs by providing analysis of your energy bills, finding a supplier with a better discount and price rates to suit your home or business property. A site assessment will provide the household or business with suggestions on how to reduce your energy consumption including the analysis report and recommendations. If required, trades and some product recommendations will also be provided. Energy Ninja also proudly supports The Epilepsy Foundation and Brainwave. Energy Ninja is mobile and will drive to you.